The terrace made of aluminum was installed. The solar heat passes the roof as for bronze at the midsummer because the roof material is made of the polycarbonate. 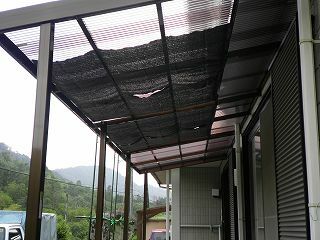 Then, the sunshade was installed with under of the roof of the terrace DIY. It is a photograph where this photograph installed the sunshade under the roof made of the polycarbonate of the aluminum terrace. The sunshade puts the one of the size of about 1.4mx4m though the size of the roof is about 1.8mx7.2m. The sunshade was just put up only to the part in the living room. The material used for the part of the sunshade used the seat where it was black made of the polypropylene. This seat used four one of 100cmx140cm by the one that had been sold in the hundred-yen store. It was 105 yen a piece. It binds to the aluminum terrace by using stainless wire Φ1.2mm for on the seat made of the polypropylene and the edge below. The seat is wrapped around this wire and it stops it with stapler. It is possible to install it very easily. A central part in the sunshade seat hangs down only by stopping on the sunshade and the under. Then, two above-mentioned stainless wires are put under the seat as a hanging down measures. The sunshade is removed at time other than summer. The sunshade is removed because it is unnecessary at time other than summer. The method only removes the sunshade seat with a stainless below on, wire. It is not necessary to remove a stainless wire of the hanging down measures. In addition, to prevent sunlight, use a green curtain. To prevent sunlight from the south, a green curtain is done though part is reflected in this photograph. A green curtain is to use a flowering plant the vine such as the morning-glory, balloon vines, and loofahs for the opening taking off on the day. I used the morning-glory and the loofah. Well, can the summer of this year be spent comfortably?